Comm Eye Health Vol. 18 No. 54 2005 pp 96. Published online 01 June 2005. Ophthalmologist, Juan Leon Mera, 453 y Roca, Quito, Ecuador. In the Tumbaco valley, 40 km northwest of the capital city of Ecuador, Quito, there is a group of eight small towns with a population of 150,000 inhabitants, most of whom are mixed race (Mestizo) and 15% are indigenous people. The main source of income is agriculture, with an average monthly income of less than US$100. Prior to 1995, access to eye care was poor. 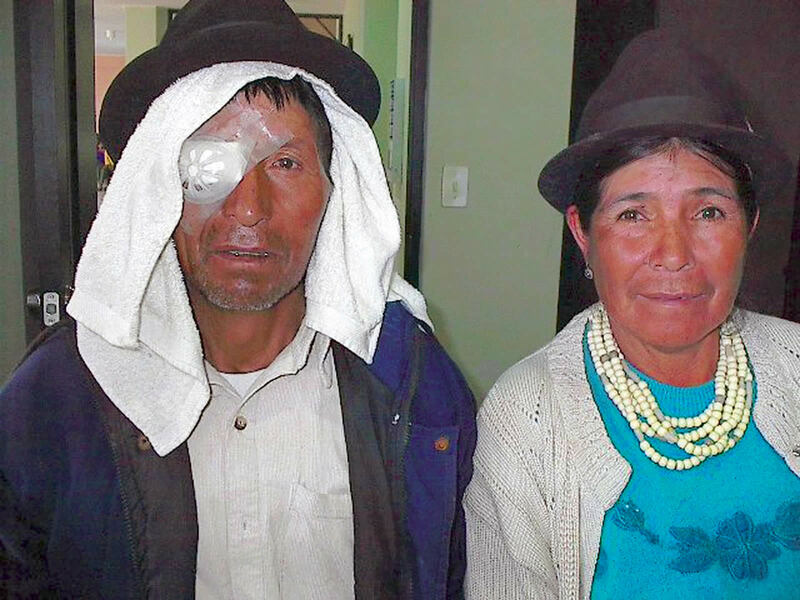 In April 1995 the Community Ocular Health and Valley Programme was started in the town of Yaruqui, with support from the Christian Blind Mission International (CBMI). The unit consisted of three rooms, with basic ophthalmic equipment. It was staffed by an ophthalmologist, an ophthalmic nurse and an administrator. From the outset, the emphasis was on cataract, although the unit catered for all eye diseases. The number of patients attending the unit gradually increased, as did the number of operations. However, a lot of work was required to inform the community about the need for eye care and to let them know about the services that were available. In 2001, with support from the German Agency for Project Development (BMZ), German Lions Club, and CBMI, a larger clinic and dedicated operating room were built, and diagnostic equipment was increased. This led to an increase in demand for the service by the community. Approximately 100 patients now visit the unit every day. Patients present with cataract and diabetic retinopathy, and a pilot programme is in place for refractive errors and glaucoma. The unit has four ophthalmologists, two nurses and six ophthalmic assistants. One ophthalmologist works full-time in the unit, one part-time and the other two doctors work one day per week. It is difficult for ophthalmologists from the city to travel 40 km to work in the project and this has been a limiting factor to the growth of the programme. Currently, a good number of operations, technology, social motivation and an economic incentive encourage the ophthalmologist to work in this poor area. Once a month outreach campaigns for cataract surgery are conducted in very poor rural areas in the surrounding provinces. This has led to a substantial increase in the consultation volume and operations (Figure 1). For the outreach activities, the administrative staff contact local community authorities, identify needs, dates and a location to conduct the screening and operations. On the established date, two ophthalmic assistants and one nurse screen and select patients with VA <20/200 (6/60) for cataract surgery. The patients arrive for the screening through communication work with local radios, churches, schools, etc. The screening includes visual acuity with and without pinhole, biomicroscopy with slit lamp, intraocular pressure and direct ophthalmoscopy. The staff contact patients’ families to discuss the surgery date, fix the price each patient can pay, and explain the surgery. One week after the screening, a complete working group of two ophthalmologists, four ophthalmic assistants, two nurses, driver and administrative staff arrives for a two or three day surgery campaign, usually over the weekend. All the supplies, microscopes and equipment are taken from Yaruqui Clinic. In suitable cases, the community helps with providing food and lodging for the clinic personnel. Sutureless manual phacofracture small incision cataract surgery is performed. As sutures do not need to be removed, there is less infection, minimal astigmatism and a quick patient recovery. Patients who received surgery are followed-up the next day and again eight days after the surgery. Currently in the Yaruqui unit, there are no specialised low vision personnel so we maintain an agreement with a local institution in Quito to manage these patients. We hope that Yaruqui clinic will have a low vision service in the future. In the outreach activities, the screening and ophthalmic examination are free. Cataract surgery cost is between US $5.00 and US $80.00 all included (supplies, medicines, etc). In order to be able to manage these costs, we use donations from people who want to help with this work. For outpatient consultations in the clinic of Yaruqui, there are stratified rates that range from $0.50 up to $3.0. The average cost for cataract surgery is $83 (range from $30 to $200), which includes all the consumables; the price means that surgery is affordable for even the poor people. Despite being so close to the capital city, 80% of those attending the unit are poor, or very poor. The unit has become a referral centre for different provinces where eye care services are deficient or expensive. Patients recommend our clinic because of the affordability, the quality of attention they receive, friendly people, and good results. Our challenge is to cover the five high priority strategic areas of VISION 2020 and to have a CSR of 3,000 by the year 2010, this will require approximately 450 cataract operations per year (Figure 2). Our intention is to reach 100% selfmanagement and economic sustainability over the next two years, which is currently 93%. At present, income is generated as follows: 88% from consultations, diagnostic examinations, surgery, optical shop and pharmacy; 3% from individuals, friends or institutional donations; and 9% from CBMI support. Our expected self-management costs will cover only operative costs, salaries, mobilisation, maintenance, small equipment requisition and supplies. It will not cover bigger items of equipment for which we will need at least another five years of external support.